Your body as instrument-to be the visual interpretation of what the ears hears in the music, to draw the sounds with isolated parts of your body, utilizing & honing muscle control. Directly off the Kennedy (90/94) expressway, exit Belmont if west-bound & turn Right; or exit Kimball & turn Left at Belmont if east-bound. Easy/Free Street Parking on Belmont, Troy, Irene & Albany. Public Transport: We are 1 block east of the Belmont stop on the Blue line, 6 blocks north of the Logan Square Blue line stop. 22 blocks west of the Belmont stop on the Brown/Red/Purple lines, Belmont (#77) Bus, Albany stop. Classes with Sonya are going on right now @ Arabesque Dance & Fitness! Please Pre-Register for your class/session, $98 for 7 classes. Finally! A workshop where the goal is to be playful and emote in a seductively stylish way! Take all that belly dance training & give the St. Valentine's gift that cannot be returned, nor would it want to be! Sonya will present a short and relatively simple routine with a 3 yard sheer silk veil that is meant for *your Hunny's eyes only* packing the show with not the most difficult moves, but moves with attitude and coyness, being sweet yet sharp, bold but with humor. This workshop is for all levels, impressing that the delivery has just as much impact as the message itself! 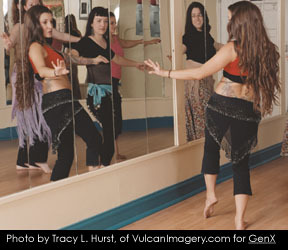 Participants should have an understanding of fundamental belly dance movements to get the most out of this workshop. All steps will be broken down for technique; however the goal is to learn the veiled routine. You will not be removing clothing. Notes and MP3 is included in workshop price; a variety of veils will be available for purchase. You may wear typical belly dance class attire; however feel free to dress up with the addition of a long/full skirt. (Please note that wearing velvet or coins tends to make the veil stick to you, so perhaps avoid it for this class.) Email Sonya for questions or concerns on this workshop's content.